This is, unfortunately, the image of protestant evangelical worship for much of USAmerica. But the only worship I see is two false prophets, drunk on power and money, worshipping one another and being worshipped by an adoring crowd. If I am over-critical, I apologize. That's honestly what the image brings to my mind. Aah! My eyes! My eyes! Hinn and Copeland. Verily, how do we undoeth the damage wrought upon God's people by these purveyors of untruths? In the gap of time it takes to respond others have given my gut reaction!!!! Beyond that worship involves seeking the transcendent truth and honoring Him. The otherness contained in this pursuit disappears with this image. Cast away the personalities paint other faces there the result shows a face to face encounter between created beings. Encouragement this may be but seeking the transcendent it is not! Therefore true worship it is not! Am I responding with righteous anger for Yahweh’s people YES YES YES I too have seen and picked up and put back together the lives the “teaching” these men and the false segment of what the deceived believe to be Christianity has left behind! Who is healing whom? That's all I want to know! Who's leading the dance here? You're coming up with quite an interesting collection of pictures. Where are you getting them? Google? 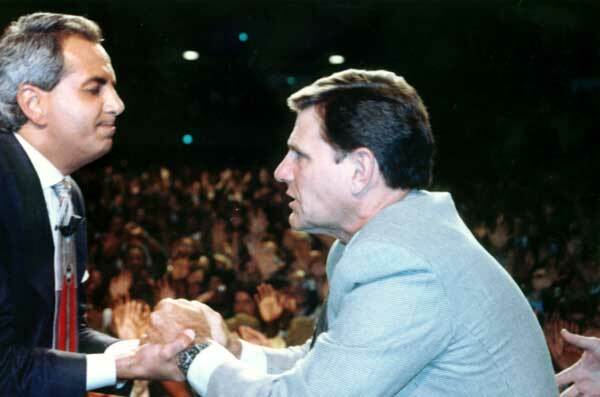 Anyhow, Hinn is a pretty controverial fellow, to say the least, not to mention the other false teacher, Copeland, in the picture. Some people think that beneath Hinn's "comb-over" are a pair of horns, and that he has cloven hooves for feet. Other people think that he is merely an empty fraud (a sort of bad imitation of Katherine Kuhlman), howbeit a very wealthy fraud at that. But there are scads of very needy people out there who are going through unending misery, pain, and suffering. And having nowhere else to turn, it's sad, very sad, that they end up going to one of Hinn's miracle services, hoping to find some hope. And the reality is they are sent away empty handed. Is this something to rejoice about? Yeah, evangelicaldom has its stinking downsides. Is that one of the things you're out to prove? Okay. Proven. Looks like Copeland is praying with a constipated Hinn. Lord, MAKE it come forth! Wow - Looks like Copeland is proposing marriage to Hinn... Has it come to this?? It is unwise to be an accuser of the breatheren. this isn't evangelicalism to me. both these preachers are pentecostals. ok, that distinction might be lost in today's media enviroment, but to me, it is still pretty significant. The men pictured are neither Protestant nor Evangelical -- in theology or practice. once again, no my style. but i don't like the negative stuff about them. we could cynically pick on every leader of every arm of the church. but why? i see no good coming out of it.